The feminized Glue Gelato Auto seeds from Barney´s Farm comes to Experiencia Natural to make it easier for you to work as a grower and delight you with a selection of genetics from the west coast of the United States that will give rise to this marvel of chocolate flavor, sweet and spicy and a very good production and mold resistance. 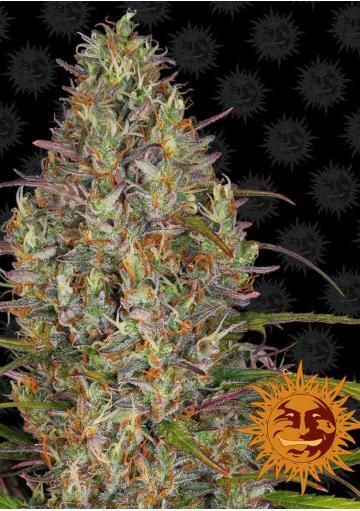 Barney´s Farm's Glue Gelato Auto marijuana seeds come from elite cuts on the West Coast of the United States that this prestigious seeds bank has discovered and combined to create this autoflowering jewel. In this case you will enjoy a delicious blend of Gelato and Glue at its best. This hybrid stands out for its adaptability, a very sweet but quite characteristic taste and an enchanted and hypnotic effect that makes all your worries disappear. The Glue Gelato Auto has an average height of no more than 120 cm, which makes it discreet and handy as well as very easy to grow. As if this were not enough, Barney´s wanted to make it even easier, adding to this auto a very high resistance to mold, the feared botrytis and the spider mite that growers hate so much. It has a medium resistance to cold, so a good advice would be not to plant too early outdoors or otherwise start growing in a protected place before taking it outside, to help a little. The production of the Glue Gelato Auto of Barney´s Farm is obviously quite fast, since from the seed to cut its sweet buds do not spend more than 9 to 10 weeks. The production will be great, this auto can reach up to 400 grams per plant outdoors and up to 600 per square meter indoors. You only need about two months to see these wonderful results. If we talk about the effects produced, we will say that you will go directly to a relaxed condition, you will be very calm, making the daily worries disappear, even if only for a few hours. You can rely on Glue Gelato Auto to improve your mood, you will feel happy, almost euphoric, but without altering your mood by helping you reach a quiet mood without being stunned. The flowers of this genetic strain give off a very sweet fruity aroma with milder notes of earthy and citrus smell, which already attracts us a lot, but when you smoke it, to finish off the task, you will notice a chocolate flavor and a spicy fruity sweetness that will end in the mouth with sweet berries to finish. He will not leave anyone impassive to taste it, glad to have crossed his path with her. Full cycle: 64-70 days on indoors and outdoors.